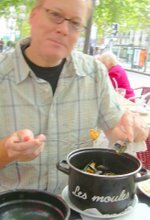 Posted byDave the Wine Merchant	 October 19, 2009 March 24, 2013 1 Comment on Moules Marinieres – Mariner’s Mussels, the Highway to Heavean! For one of my rather large birthdays, the kind that either demands a grand celebration with friends or a quiet closet in which to whimper, Superwife and Cole surprised me with a trip to the Loire Valley. One of my favorite meals was at this street side cafe in Tours. This simple meal – mussels, crisp french fries, a fresh baguette and a cool glass of local Chenin Blanc – brought me closer to heaven than I probably deserve (or will ever be again, now that St. Peter knows I’ve found this loophole). When paired well, the right wines can provide the same slice of Tours street side nirvana. So pull a cork on one of these wines, splash some into your glass, then add some fresh-shucked oysters or steam some mussels (recipe below) and you’re in for an hour of pure happiness. Moules Marinières are also known as “Sailor’s mussels” or “Mariner’s mussels.” This basic dish consists of fresh mussels delicately steamed in white wine with garlic, parsley, butter, onion and cream sauce. The addition of lardons by the chef at our sidewalk cafe was a unique twist, adding a permeating smokiness. Along with the small amount of cream added to the juice, this extra richness suggests a fuller-bodied white wine – an austere wine will fight this dish. Think Dry or off-dry Riesling, Chenin Blanc, unoaked Chardonnay and perhaps even Viognier from a cooler clime. Be sure to have a good baguette (more than you think you’ll need) to dip into the delectable sauce and juices once your mussels are gone. Mussel veterans eat by using an empty mussel shell as a pincer to pick the remaining mussels from their shells – a fun way to eat with your fingers! Clean, debeard and rinse the mussels several times in cold running water. Discard any that do not snap shut when tapped and set the rest aside in a colander. Cook the lardons in the bottom of a wide, deep pot until crispy but not burned. Remove, drain on paper towel. Remove all but one Tbsp of bacon fat, add enough butter to equal 2 Tbsp total, then add the chopped shallot and garlic. Cook for a few minutes on a medium heat until the shallots have softened. Add the white wine and bring to a boil, stirring occasionally. Add mussels and cover, cooking on a high heat for several minutes. Gently shake the pan several times during cooking to redistribute the mussels. It is best to remove the mussels one by one as they open, placing them in a colander with a bowl underneath to catch the juices – liquid gold. Again, discard any mussels that have remained tightly shut, as they may produce unpleasant gastro-intestinal side effects (you don’t want to know). Return the lardons to the liquid and boil until reduced by half. Stir in the cream and parsley. Taste the sauce and add salt or pepper to taste. Transfer the mussels to a large bowl, pour the reduced liquid over the mussels, and serve immediately. Pair with any of these wines and you’ll agree that happiness is at hand. Heh am I really the first comment to your incredible writing?! ?